One of the most exciting new features of the W3016-16-RGB module is the ability to store up to 200,000 frames of Motion Graphics content in the internal on-board memory of the modules themselves. This content can then be played back by the panel in “standalone” mode, without any need for an external controller. Video content essentially becomes another Signal Source available to the Sensacell display engine, and it can be mixed and matched with the other sources to create rich and complex effects. 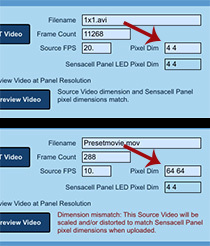 Unlike other Signal Sources that scale to different size panels without modification, the content for a Video-based Preset is generally authored (outside of SensaSynth2) to specifically match the dimensions of your panel. In addition, once you’ve uploaded your video content you will configure Video-based Preset parameters to trigger specific bits of content in that video in a specific way, which is to say that these Presets could generally not be used either on other panels or with other video content. 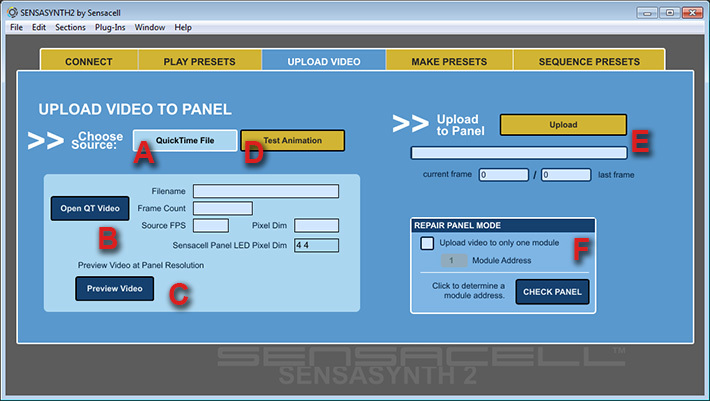 To see some tips on how to generate content for Sensacell panels, see this section. The general idea is to author the video content clips you want to use in a third-party program, combine the clips into a single movie, save this movie as a QuickTime compatible file, and finally use the QuickTime File interface (the default tab) here to upload it to the panel. 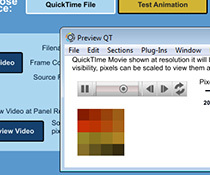 If you want to upload video content for learning or debugging purposes without having to author a QuickTime file, use the Test Animation tab to have some simple video content programmatically generated for you. When a QuickTime file is uploaded, SensaSynth2 displays each frame one-at-a-time on the Sensacell panel and then each module stores its own “pixel” data consecutively into its on-board memory. For precise results the uploaded content should be authored to “pixel-match” the display dimensions of the panel. 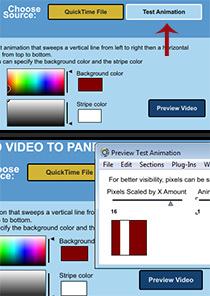 If the source QuickTime file dimensions do not match the panel you will see the alert on the bottom image to the left. If the file is uploaded anyway, it will be scaled to match the panel dimensions, and it could also be distorted (if the aspect ratios are different) as well as scaled. This opens a pop-up window that lets you view the video you are about to upload. The video preview will show the content in the “destination resolution” of the Sensacell panel, so this is a good way to see the effects of any scaling or distortion of your source content if it is not pixel-matched to the display dimension. There is a slider that scales the size of the preview to make it easier to see, although this scales the size of the displayed pixels, not the pixel count itself (so that the image is shown bigger and “blockier”). An alternative to using a QuickTime file if you want to test uploading or debug your panel. This tab lets you upload an animation of a horizontal stripe sweep followed by a vertical stripe sweep. The animation automatically generates to match the size and dimensions of any attached Sensacell panel. The background color and the stripe color can be configured using the two Color Swatches, which is useful if you want to make sure you are uploading new content when testing multiple passes. Like with the QuickTime File tab, there is also a Preview Video button that lets you see the animation in a pop-up window. The Upload button begins uploading the QuickTime file you have designated or the Test Animation, as the case may be, to the Sensacell panel. The user interface below the Upload button tracks the progress of the upload, and you will also see each frame rendered on your panel as it goes along. The upload time is determined not only by the number of frames in the source file, but by the size of the destination panel, since the upload rate is constrained by the inherent bandwidth of the serial connection. Larger panels have more data per frame and consequently slower upload rates. The upload can be canceled at any time by clicking the Stop Now button. This however leaves the currently uploaded portion on the panels – as the previous content has already been erased, it cannot be restored without a new upload. If a module goes out for any reason in an installation and needs to be replaced, this mode allows you to replace the video on this single module only, assuming you have the original video that matches the content on the other modules. For big panels with long source movies, this can be a significant time saving. With Sensacell’s interactive, atmospheric, touch-sensitive LED panels. ©2019 Sensacell. All Rights Reserved.